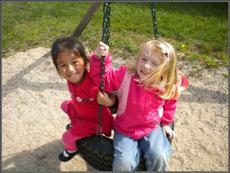 Milestones offers a full day Junior Kindergarten program as an extension of the Infant, Toddler and Preschool Programs. Our full day program is currently housed at Plymouth Church on Summit Avenue in Milwaukee. During the school year, the academic component of the program runs from 9:00 AM to 3:30 PM with extended care available from 7:00 AM to 9:00 AM and from 3:30 PM to 6:00 PM. During the summer, an all-day program that emphasizes recreation and outdoor activities is offered from 7:00 AM to 6:00 PM. The Kindergarten program is designed around a developmentally based curriculum which includes Science and Social Studies, Language Arts, Pre-Reading, Math, Creative Arts, and Physical Education. There are also opportunities for cooking and baking, field trips, gym and outdoor play, as well as ample time for individual choices and play activities. The curriculum implements the philosophy that children learn best by having the freedom and encouragement to move around the classroom and interact with their world. The teacher sets up the classroom and program to create a rich learning environment with many and varied opportunities for hands-on activity. Children are encouraged to explore, discover, and enjoy as they work individually and in groups. The teaching staff keeps current on the curriculum and requirements of area school systems to ensure that the children are well prepared to enter 5 year old kindergarten. A primary objective of our program is to provide an atmosphere in which the children can develop positive attitudes toward themselves and others. Feeling good about oneself and having the skills and sensitivity to work well with others will provide the groundwork for school success throughout our children's lives.